Visibly Soft Clothes: Leaves clothes feeling soft, smooth & great to wear. Easy to use: After washing with detergents, pour a cap of Comfort in a bucket of water & soak clothes for 5 mins. Remove and dry them. Don t rinse the clothes again. Want your clothes to shine like new every day? 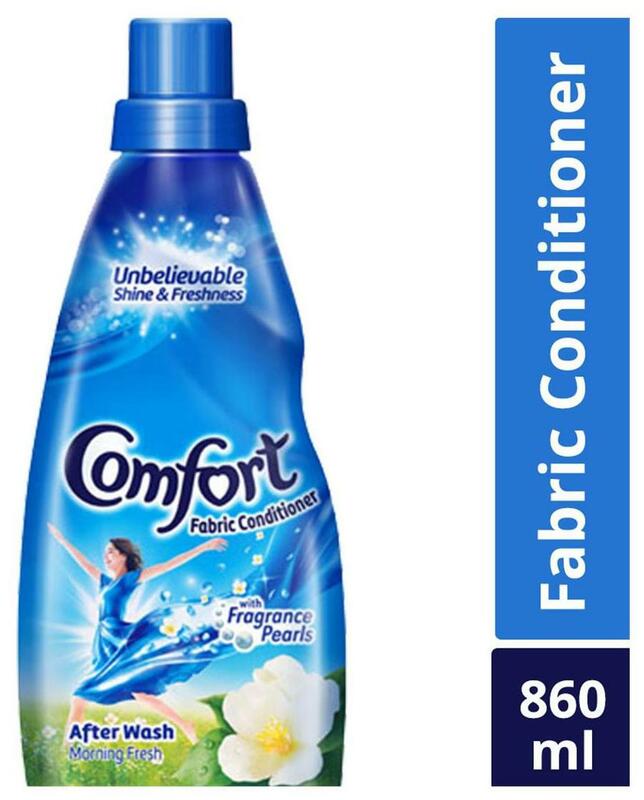 A small step of Comfort After Wash Fabric Conditioner Morning Fresh (Blue) 860 ml gives your clothes unbeatable shine, that detergent alone can t deliver. Even if you use the best detergents, repeated washing can tangle cloth fibres, making them rough, dull & lifeless. Taking a small step of Comfort After Wash Fabric Conditioner nourishes the cloth fibres damaged by detergent, giving them new like shine even over repeated washing. Not only shine, our range of fabric softeners gives visible softness to your favourite clothes while also delivering a long lasting freshness. How to Use: BUCKET WASH: After washing your clothes with laundry detergent, pour a cap of Comfort in a bucket of water, and soak your clothes for 5 mins. Remove and dry them. Don t rinse the clothes again. SEMI-AUTOMATIC: Wash your clothes with detergent as usual. Pour 1 cap of comfort in machine tub in clean water during the last rinse cycle. TOP LOAD: If your machine has a softener compartment, pour 1 cap of comfort at the start of wash cycle. Otherwise, pour 1 cap of comfort in machine tub during last rinse cycle. FRONT LOAD: Pour 1 cap of comfort in the softener/conditioner compartment at the same time as you add detergent. Add a small step of Comfort Morning Fresh to your regular laundry routine and experience unbelievable shine, visible softness and freshness. Pick up your favourite Comfort today!